If the walls of the former Carneros social hall could talk, they’d likely tell stories of many a party and dance, not to mention more than a few math and spelling lessons. Located on a stub of the Old Sonoma Highway beside the entrance to the Carneros Inn, the nearly 100-year-old hall was a social hub for the farm and dairy families that populated the Carneros region south of Napa in the early 20th century. In the late 1970s, the hall became home to a small private school. Since the late 1980s, it has sat empty and forlorn, its prospects for the future seemingly dimming with every passing year. Today, the old hall is listed for sale for $190,000. The property is owned by the di Rosa organization, operator of the nearby di Rosa art museum, said listing agent Cathy D’Angelo Holmes. The plain one-story building was built about 1913, according to the Napa County Historical Society. In a 2007 Register interview, Dorothea Miller of Napa recalled the club as a beehive of activity for everything from 4-H meetings, card parties, wedding receptions, Farm Bureau meetings and adult dances — often to the music of the Baley Orchestra. It was also the site of an annual St. Patrick’s Day dinner of corned beef and cabbage. Alcohol was not permitted, so during intermission everyone rushed out to their cars, she recalled. 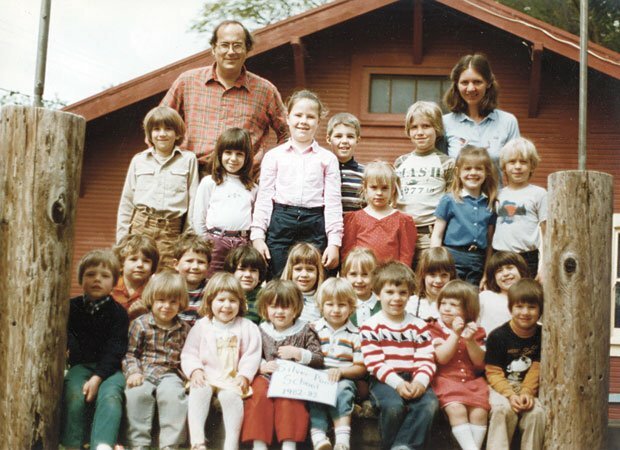 From the late ’70s to the late ’80s, Janet Borba and Parker Hall ran a private school, Silver Pony, in the former hall. “We had fond memories of it,” Borba said. The rent was inexpensive, probably no more than $400 a month at the time, she said. The couple had heard that the former owner, Rene di Rosa, liked the idea of a one-room school as a tenant. While the old hall evokes memories of yesteryear, today some might call it a white elephant. “This is not your typical sale,” D’Angelo Holmes said. The building is not functional. It lacks water or sewer service. It has been empty for decades. As Rene di Rosa grew older, he was not able to provide direction on what to do with the building following his death, Kathryn Reasoner, executive director at the di Rosa museum, said. “I don’t think we’d turn down a reasonable offer,” Reasoner said. Francis Mahoney, a longtime Carneros grower, said he’d like to create some kind of agriculture-themed museum at the site. “I think it can be a wonderful resource for people visiting the valley,” he said. Napa County Planning Director Hillary Gitelman said the property is zoned for agricultural use but could be utilized as a meeting hall or events space. The county recently identified the structure as a historical building. If a new owner wanted to tear it down, the owner would first need to determine how much of the structure’s original historical integrity remained. “That will require some investigation,” Gitelman said. If enough structural integrity remained, “we would ask the owner to rehabilitate and reuse it as a historical building.” If the new owner wanted to demolish it, they would have to go through a lengthy process to receive such approval, she said. Could that be a hindrance to a new owner? “It depends on what the new owner wants to do. That would be something we would work with them on,” Gitelman said. The property is near the main entrance to the upscale Carneros Inn. “I love that we have that bit of history here,” said Keith Rogal, who developed the inn and lives in a home on site. “I hope someone will find a way to bring new life to what was a very active part of the Carneros community,” said Rogal, who added he has no interest in buying the property. Nick Monroe, chief financial officer and general manager of Carneros Holdings, which owns the Carneros Inn, said his group isn’t interested in buying it either. However, “We would certainly like to see it preserved as a social hall,” Monroe said. Carneros Holdings has already provided some maintenance in recent years, including roof repair and landscaping. “We did that mostly because Rene was able to do less and less in his last years. With his permission, we maintained it so it wasn’t a fire hazard,” he said. Further deepening those community ties, a World War I memorial dedicated to “our heroes of Carneros” accompanies the building. The large stone marker lists the names of six men who died during the war. In 2007, Miller, then 84, said her uncle, Steve Nonella, was one of the names listed on the monument. Miller recalled that the memorial used to be located at the old Carneros School across the street from the hall. After the school was demolished, it was moved near a tree next to the front door of the social hall. Mahoney said he estimates it would take $500,000 to turn the old building into a museum staffed by volunteers. “It needs some serious structural work,” he said. He’s hoping to raise the money privately from supporters throughout the valley. “It’s not just a Carneros thing,” he said. “I’m looking for people who would love to preserve this old hall,” Mahoney said. Susan Hirschy is familiar with what it takes to preserve such a property. Hirschy is the official “master” of the Rutherford Grange, an Upvalley building that dates from about the same time as the Carneros social hall. 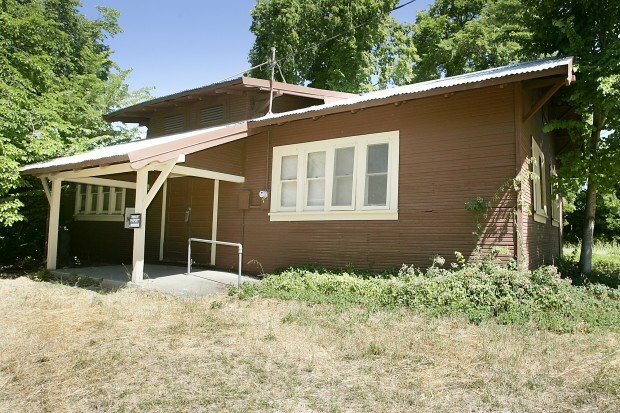 Representatives from the California Grange association were unable to determine if the Carneros hall was ever an official grange, but grange or not, “It’s a lot to bite off,” Hirschy said. To save an old social hall “takes a real commitment within the community and from the people who have the funds to give,” Hirschy said. “If the right idea comes along, you’ll have people flocking to it,” she said. To reach Francis Mahoney about preserving the hall, call 253-9463.
cooperative government, now there is an oxymoron. ...and I could be wrong, but I'll bet that greed of some kind in parceling-off the land around it so that pieces could be sold and/or leased to others is the biggest reason there's almost literally no space for parking -- even if trees were cut down, from my cursory look at arial photos -- is the biggest reason. If I'm right (and, hey... listen... I'm usually not, so be sure to factor that in), then it's difficult to read about the seller now singing the blues in this article because the property's now unsuitable for... well... pretty much anything... at least if it involves more than a handful of people at a time simultaneously being there. Actually, looking more closely at it, from straight above (satellite view, rather then bird's eye view), more parking than is perhaps easily realized is actually possible. Government would need to be very, very cooperative, though, just generally. I remember going there as a child and recall it being a voting center too?!? I need to chat my Mom up since I recall I was always with her when I went (so long ago). A Carneros Grange Hall would be a heck of an idea...The water and sewer could pose an issue though. Grange halls, what memories! When my sister and I were in our teens, we must have attended parties at just about every grange hall in Napa and Sonoma Counties. Live bands and....whew, fun! For awhile during my teens, I attended school in the town of Sonoma. When I saw the photo of the Carneros Social Hall, there's no doubt I attended parties there. As someone mentioned, there wasn't much of a profit motive for the cover charge. Bands often played for free, or for beer! Those days are now gone because of liability issues. As far as I know, that started as the Carneros Farm Center, so I'm wondering where the year date came from. If so the date is wrong. My grandfather built the Mt. George Farm Center [now the Welcome Grange] on Hagen Road in 1916 and it was the first one in the COUNTRY. He then went around the county with Herman Baade, the Farm Advisor to all the groups in the county and over into Sonoma Co., talking the members into building their own meeting halls. As far as the monument, I have been concerned about it and have been working with Brad W for a solution. I drove by this afew weeks ago and party time came to my mind. I hope Carneros Inn doesn't get their hands on it. If nothing else move the whole thing to Skyline Park! Obviously, another fiasco of failed liberalism. This is a lovely old building, reminiscent of places like Napa Horsemen's, and other social club halls from that era. I believe there is a volunteer County Fire station directly across the road from the building. Perhaps the County Fire Department could use this building as a south county meeting hall and emergency operations site, and and maintain it as a facility that the public might rent for events? There are grants and funds available for just this sort of thing, in my experience, and saving and upgrading the building for a multiple use asset would be a winning solution for everyone. Your map graphic in the photos section of this article is incorrect. It shows the Carneros Inn and Old Sonoma Hwy as being located on Hwy 29. The correct roadway is California State Route 12/121. Has there been any talk of moving the WW! Memorial to Veteran's Park ? I only meant that with a small bit of sarcasm. I personally wouldn't want to have to go to that area to visit it. If walls could talk many of us who spent time in that building would have long since left town. I was thinking the same thing! Many a Napa College (before it was Napa VALLEY College) parties held there. We used to rent it, get a local band to play, get a keg and charge $1 at the door. Totally no profit, but paid expenses...and we had tons of fun! We were the runts hanging around the dark edges meeting Ridgeview babs...that was a long way to ride a bike from Belair. It would be a shame for this historical building to be razed. It should be bought, restored and turned into a Carneros type of museum telling the history of the region and the valley, as well as once again a social hall back to it's roots and former glory.